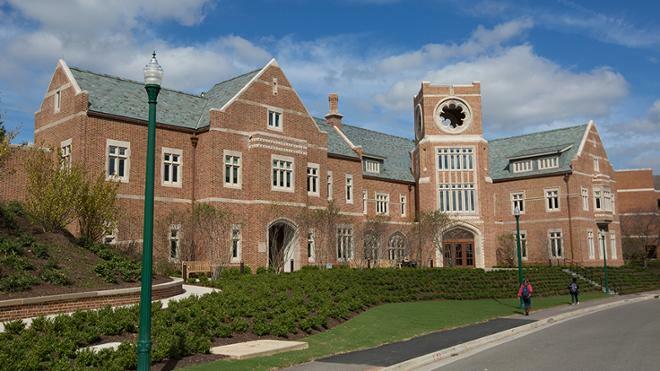 University of Richmond's Queally Center was honored by Brick in Architecture with a silver award for higher education. The 2018 Brick in Architecture Awards honor 19 winners for outstanding design that incorporates clay brick. “Fired-clay brick offers unlimited aesthetic flexibility and is an integral part of any sustainable, low maintenance building strategy,” said Ray Leonhard, BIA’s president and CEO. Located near the main entrance to campus off of River Road, the Queally Center serves as the front door for prospective students and their families. It integrates the offices of admission, financial aid and employer development under one roof, transforming the visitor experience and serving students from acceptance letter to job offer letter. Distributor: Shade & Wise Brick Co, Inc.